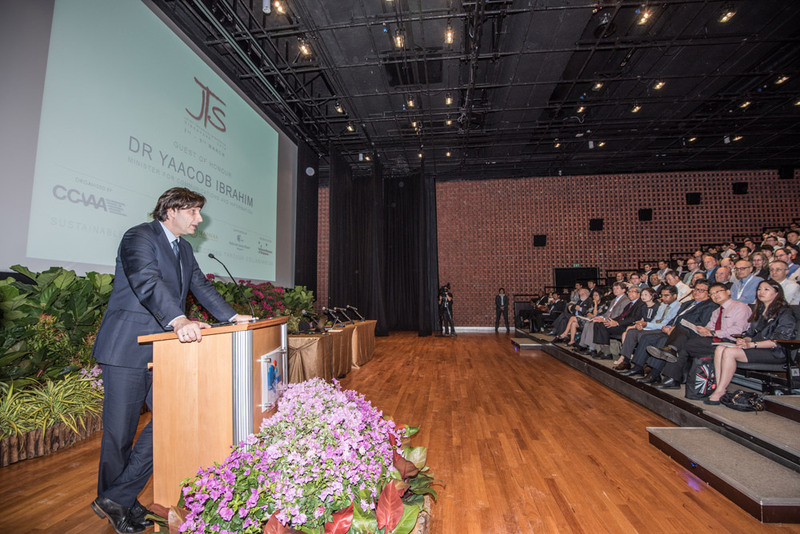 CCAAA Chair Jan Jan Müller addressing the audience of the 2016 Joint Technical Symposium in Singapore, March 2016. The Joint Technical Symposium (JTS) is an international scientific and technical event dealing with matters of particular importance to audiovisual archives and archivists. Organized every few years since 1983 by the various audiovisual archives associations now forming the CCAAA, it provides an opportunity for colleagues around the world and those interested in the field to meet and share information about the preservation of original image and sound materials. The 2016 JTS, which took place in Singapore in March 2016, was the ninth since 1983. The first Joint Technical Symposium, entitled “Archiving of the Moving Image in the 21st Century”, took place at the Swedish Film Institute in Stockholm, 1-4 June 1983. Co-organized by FIAF and FIAT (now FIAT-IFTA), it was part of that year’s FIAF Congress. It dealt primarily with film and video, and included high-quality technical papers, workshops, visits to film and video institutions, and a small exhibition of film equipment with potential use in archives. The papers reflected the concerns of the day: the handling of film and videotape, the preservation of nitrate film stock, and the impact of new technologies such as optical discs. You can download the proceedings of the event, published by FIAT-IFTA in a special issue of the FIAT Newsletter (January 1986) HERE [44Mb]. The title of the second JTS was “Archiving the Audiovisual Heritage”. The event took place in May 1987 in the International Congress Center in West Berlin, and was hosted by the Stiftung Deutsche Kinemathek. It was once again attached to the annual FIAF Congress. The symposium’s organizing committee consisted of members of the Technical Commissions of FIAF, FIAT, and IASA, thus recognizing the need for film, video, and sound archivists to discuss similar challenges. The Symposium attracted over 300 delegates. UNESCO supported the event by offering a number of travelling grants for delegates from developing countries. The proceedings of the Symposium were published by the Stiftung Deutsche Kinemathek in 1988 under the title Archiving the Audiovisual Heritage: A Joint Symposium. They can be accessed HERE [56Mb]. The third JTS took place at the Canadian Museum of Civilization in Ottawa, 3-5 May 1990. It was organized by the Technical Coordinating Committee of the International Round Table on Audio-Visual Records (predecessor of the CCAAA), and was composed of representatives of FIAF, FIAT, IASA, ICA, and IFLA. One of the main concerns was the chemical stability of carriers, as delegates discussed the need to copy images and sound stored on carriers previously thought to be indestructible. Digital recording techniques were also part of the discussions. The proceedings of the Symposium were published in 1992 by UNESCO and the Technical Coordinating Committee, under the title Archiving the Audiovisual Heritage: Third Joint Symposium. They can be accessed HERE [56Mb]. The next JTS took place at the National Film Theatre in London in January 1995. Organized once again by the Technical Coordinating Committee on behalf of FIAF, FIAT, and IASA, its title was “Technology and our Audio Visual Heritage: Technology’s Role in Preserving the Memory of the World”. Topics discussed included the ethics of archiving and the breakdown of the components of signal carriers with age; methods and projects concerning restoration and conservation of signals and carriers; and the use of computer techniques in audiovisual archiving. The proceedings were published in 1999 by the Technical Coordinating Committee. They can be accessed HERE [73Mb]. 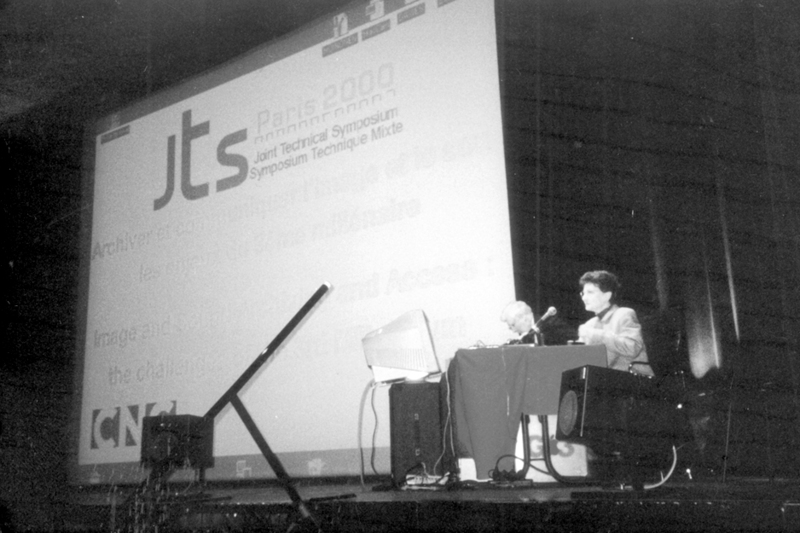 The fifth Joint Technical Symposium, entitled “Image and Sound Archiving and Access: The Challenges of the 3rd Millennium”, took place in Paris 20-22 January 2000. The proceedings were once again published (with an accompanying CD-ROM), this time by the CNC. The next two Joint Technical Symposia, in 2004 and 2007, took place in Toronto and were both organized by AMIA on behalf of the CCAAA. The Programme Committee for both events was co-chaired by Grover Crisp and Michael Friend. Their titles – “Preserving the Audiovisual Heritage: Transition and Access” and “Audiovisual Heritage and the Digital Universe” – confirmed the urgent need for audiovisual archivists around the world to discuss the challenges of the digital revolution. You can download the programme 2004 HERE and 2007 HERE. Michelle Aubert at the 2000 JTS in Paris. The 2010 JTS was organized by FIAF on behalf of the CCAAA, and took place 2-5 May 2010, immediately after the FIAF Congress in Oslo. Its theme was “Digital Challenges and Digital Opportunities in Audiovisual Archiving”. The Programme Committee was chaired by Thomas Christensen, Head of the FIAF Technical Commission. The papers were published online (and are still available) HERE. The ninth Joint Technical Symposium took place in Singapore in March 2016. Co-organized by SEAPAVAA and the National Archives of Singapore on behalf of CCAAA, its theme was “Sustainable Audiovisual Collections Through Collaboration”. The organizing committee recognized that the audiovisual archiving world has seen many dramatic changes and advancements in the technologies that enable preservation since the last JTS. It considered that the rate and magnitude of these changes requires a collaborative approach to enable all archives to make sense of the best way to keep collections alive for future generations. The official website of the 2016 JTS was http://jts2016.com/. ﻿﻿Conference attendees kept a collaborative notes document and the proceedings can be found here. JTS 2019 will place from 3 to 5 October 2019, in tandem with IASA's 50th anniversary conference (28 September - 3 October 2019). The proposed venue for both events is Amsterdam using facilities of the Netherlands Institute for Sound and Vision and EYE Filmmuseum.